Country Life Dolphin Pals -DHA Sour Gummies for Kids are all-natural, great tasting fish oil supplements that supply your children with these long chain omega fatty acids. DHA, or docosahexaenoic acid, is particularly abundant in the brain and the retina of the eye. With its fun dolphin shape, 3 great tasting flavors and easy to chew sour gummies, your child will be flipping over for more! Give your child Dolphin Pals DHA Gummies along with a healthy, balanced diet. 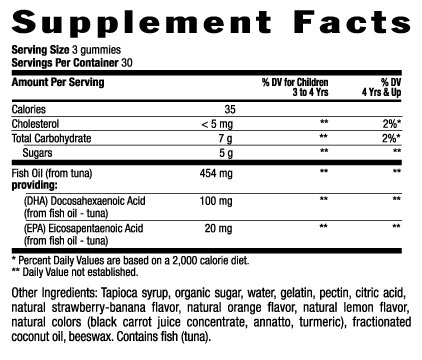 RECOMMENDED USE: Adult caregiver may give child 3+ years up to three (3) gummies once per day as a dietary supplement. NO gluten, yeast, wheat, milk, egg, soy, preservatives, artificial sweeteners or flavors or magnesium stearate. Consult physician before using if you are pregnant, lactating, using blood thinners, anticipate surgery or are taking multiple medications. NOT RECOMMENDED FOR CHILDREN UNDER 3 YEARS OLD. Other Ingredients: Tapioca Syrup, organic sugar, water, gelatin, pectin, citric acid, natural strawberry-banana flavor, natural orange flavor, natural lemon flavor, black carrot juice concentrate color, annatto color, turmeric color, fractionated coconut oil, beeswax. CONTAINS FISH (TUNA).